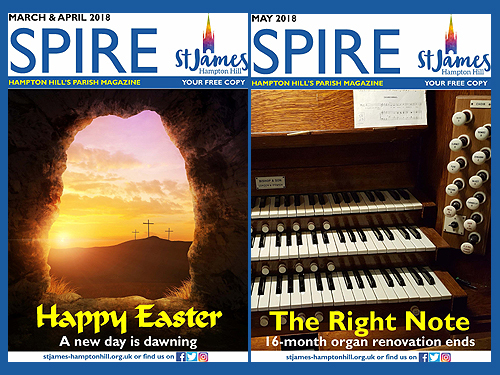 The Spire is the parish magazine of St James's Church and has developed over the years in both style and production and has been widely acclaimed as clear, accessible and informative. The magazine is distributed free, but each year there is an appeal for voluntary contributions. It is produced nine time a year, with three issues each covering two months. Have a look at the current Spire. The magazine is produced and distributed by a group of parishioners who believe that good communication is essential to the understanding and spreading of the Christian faith. The Spire aims to have as wide a variety of material as possible, including not only church notices and reports but also articles reflecting the lives of parishioners, the wider community and national or global issues. Besides the magazine’s necessary factual content - who to contact for particular needs and how to find them, days and times of services, etc., there are features which are helpful or interesting to as wide an audience as possible. The Spire Team is essentially the editorial committee who meet early each month to decide on the content of the next issue. 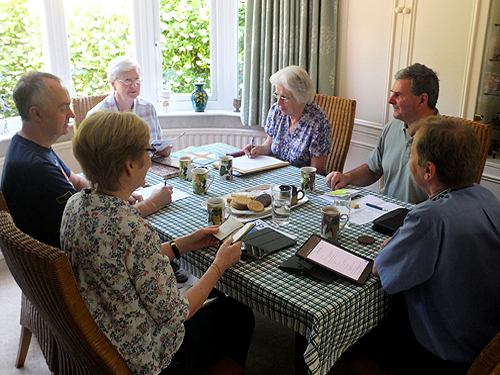 During the following two weeks, the editors gather the material, decide on and create the layout, drafts are proof-read, sent to the printer and the magazine is ready in church by the first Sunday of the relevant month. 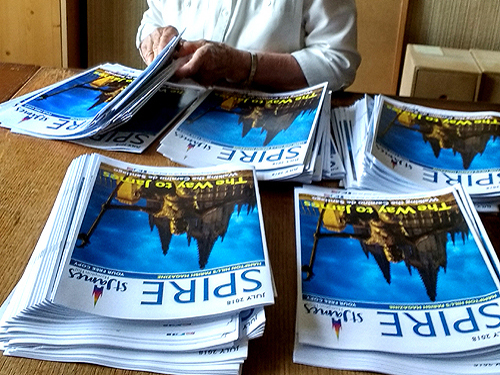 Each issue, six hundred copies are delivered to the many volunteer distributors all around the parish and beyond who deliver copies to houses in the parish every month. Copies are also sent out each time by post to a wide variety of people - past clergy, former parishioners, local churches, the Bishop of Kensington and Archdeacon of Middlesex, as well as the local newspapers, schools and hospitals. There is now also a growing group of people who receive their copies by email. If you would like to do this please see below. The distribution was reviewed some years ago and as a result more copies were placed in the High Street, at the Post Office, library, Medical Centre and dentist with the response being "outreach at its best". 2017 was another successful year and each month 650 copies were printed and distributed around the parish. It was decided that we should try to deliver the Spire to every house in the parish as a trial. The PCC agreed that we could print and extra 100 copies of each edition to make this possible. To receive the Spire by email sign up here. Find out about our privacy practices.